Britton & Brown, Illustr.Fl.ed.2, 2:570, 1913. Type: Lectotype collected in the Kobe Valley, Nevada, by Engelmann on the 24.4.1859, with a further example from the Butte Valley, Utah, collected by Engelmann on the 15.5.1859; both deposited in the Missouri Botanical Garden, St.Louis. The type plant of Pediocactus hermannii Marshall is deposited in the Douglas Herbarium of the Desert Botanical Garden in Tempe, Arizona. Echinocactus simpsonii Engelmann, Trans. Acad. St. Louis 2:197, 1863. 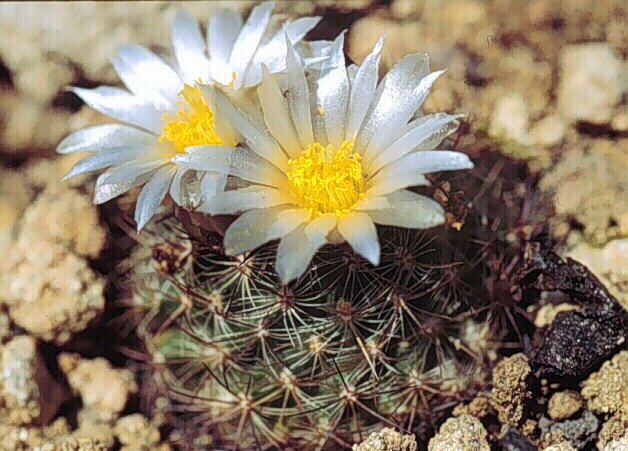 Mammillaria simpsonii (Engelmann) Jones, Zoe 3:302, 1893. Mammillaria purpusii (Engelmann) Schumann, Monatsschr.Kakteenk. 4:165, 1894. Pediocactus hermannii Marshall, Saguaroland Bull. 8:78, 1954. Pediocactus simpsonii (Engelmann) var.caespiticus Backeberg, Nat .Cact. & Succt. J. (GB), 14:63, 1959. nom. nud., Cactaceae, 5:2846 f. 2672 nom. inval.1961. 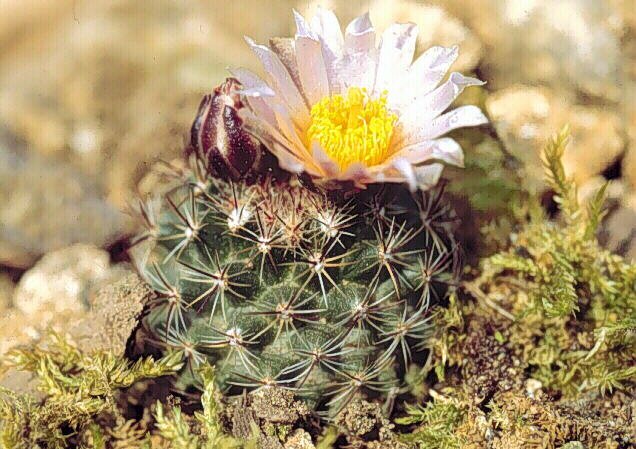 Pediocactus simpsonii (Engelmann) var. hermannii Wiegand & Backeberg, Die Cactaceae 5:2846, 1961. Arizona: fh 55.5, Pastore Peak, 2,100m, fh 55.7, Pastore Peak, 2,200 m.
fh 27.5.7, Plateau Creek, 1,800m. fh 40.1, Rio Arriba Co., 2,000m, fh 42.1, Taos Co., 2,300m. Pediocactus simpsonii ssp.simpsonii, fh 64.1, Lion Mts., 2,100m. 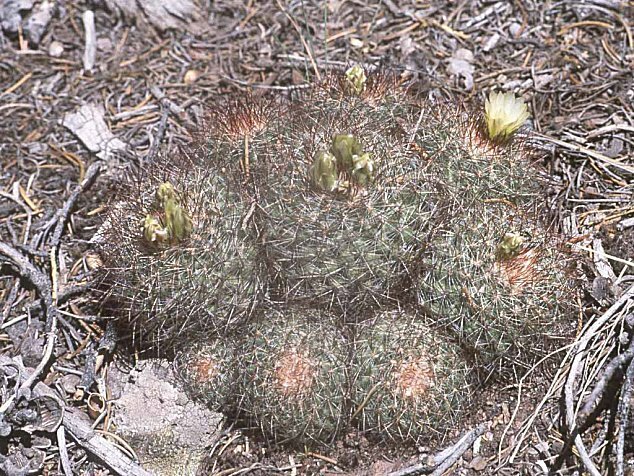 Pediocactus simpsonii ssp.simpsonii, fh 60.1, Panguitsch Creek, 2,400m. 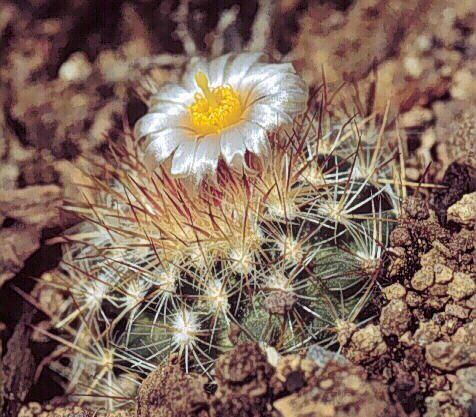 Pediocactus simpsonii ssp.simpsonii, fh 27.3.3, Rio Blanco Co.